Portsmouth is a shipbuilding town. 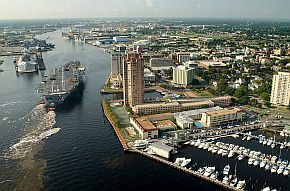 The city's 96,500 residents live near the large ports of the Elizabeth River situated in corner of southeast Virginia's Hampton Roads section. The city has supplied ships throughout the major conflicts of the country. The legendary Norfolk Naval Shipyard continues to repair and maintain ships for the US fleet. Major employees include the Norfolk Naval Shipyard, the Naval Medical Center, Earl Industries, Bon Secours Maryview Medical Center and city and government institutions. A large percentage of the city's residents work in maritime operations. The unemployment rate was 8.7 percent January 2012. With a population 50.8 percent African American, Portsmouth has a vibrant small business community that job seekers can review in a special report of the Hampton Roads Business Journal at insidebiz.com. The report discusses the top small businesses and best entrepreneurs. The Chamber of Commerce directs job seekers to a national site listing jobs in the Hampton Roads area. The Naval Shipyard seeks college students as engineering technicians, and its career link tab on the NNSY website has job announcements for civilians and programs for student apprentices. The Bon Secours site has a wide range of positions available at the Maryview Medical Center.